From cover to cover Seeing Things presents a series of interfaces: journeys in and out of real world situations; between real and mythical; between secular and spiritual; between existence and annihilation; between objective and subjective; from the present into the future; between first order experience and seeing things through new eyes. Such crossings involve a range of access points: doors, windows, gates, casements, a bridge across a ditch that unites him both with the life of his childhood (still present in the landscape and language) and a ghostly revenant, the recently deceased father whose death left the poet ‘unroofed’. Heaney pays tribute to the never distant, ever-satisfying element of his rural Ulster upbringing (Running water never disappointed). It provided a crossing point to an extension of the self (always furthered something) and stepping stones that recorded the stages in life (stations of the soul), a correspondance he borrows from the Stations of the Cross of his Catholic pilgrimages. 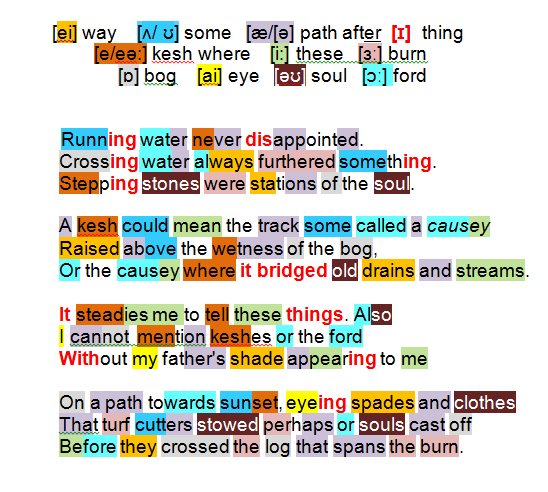 Back in the marshy domain of childhood, Heaney rehearses his Ulster vernacular: – kesh and causey variously a pathway above wetness or a soil and turf bridge over a piped culvert. To hear and feel the sound of familiar words takes him home, calms him (steadies me to tell these things) and prepares the ground for something involuntary: keshes or the ford are sufficient to bring father’s shade and living son face to face (my father’s shade appearing to me) at a spot that Patrick Heaney would have frequented in life (a path towards sunset). The revenant father acts in character, alert to the tools and work-clothes left on site for the morrow (spades and clothes/ That turf cutters stowed). Heaney is reminded of the annihilation that awaits all mankind … the labourers themselves, long dead (souls cast off), poised to cross from the earthly shore towards whatever lay on the other side (the log that spans the burn). NC (177) offers an alternative interpretation: Settings xii (metaphysical considerations of ‘spirit’ and ‘soul’ for the attention of W.B.Yeats) is accompanied in the sequence by several others which similarly register the death of the old certainties … Crossings xxxii sees the afterlife of ‘appari­tions’, caught uncomprehendingly on the territory of their previous lives. The poem’s tone is one of awkward reverence: it displays an affection for the dead that is without any gloss of Christian consolation, and its ‘shades’ are kin, in the pathos of their incomprehension and abandonment, to those of the Virgilian underworld.